brandflakesforbreakfast: Why tell a story when you can experience it? Why tell a story when you can experience it? As a parent myself, I have always been mindful of how much sugar and salt my kids are eating. It's shocking just how much sugar is being absorbed into our kids’ systems every day. 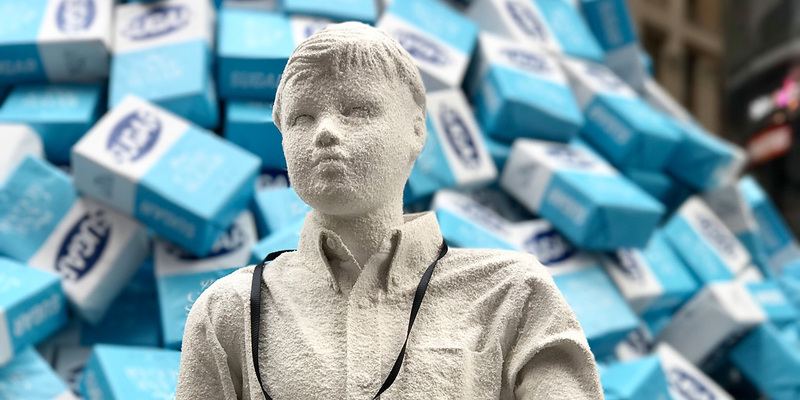 So shocking, in fact, that Kind Bars brought the statistics disturbingly to life in Times Square last week by dumping over 45,000 lbs of sugar there to show just how much sugar the kids in the US eat every five minutes! As an answer to the problem, Kind is touting its new fruit snack, Kind Fruit Bites, which contain just fruit and no added sugar. What stands out with this execution is they could've easily just thrown some facts at you in their advertising, but instead, they made the benefits of their products, juxtaposed against a problem is solves, feel like an experience that packs a MUCH bigger punch. They get that the future of marketing shouldn’t be sugarcoated!